At last year's E3, I only got a brief look at Rock of Ages, the downloadable tower defense title published by Atlus. I was definitely intrigued by the concept: rolling boulders to destroy your enemy's fortifications while setting up defense stations to keep your own fortress intact, with each level inspired by a different type of art. Sadly, the "early 2011" release window came and went with no sign of Rock of Ages, and I had to wait until today at the Atlus booth to finally get my hands on it. At first glance, Rock of Ages seems almost too easy. The core gameplay is simple: roll giant boulders towards your enemy's gate until it's destroyed. No problem, right? When you factor in the different boulder upgrades you can purchase, like a spiked boulder that can take more damage, Rock of Ages seems like a no-brainer. Of course, while your soldiers are preparing a new rock, your enemy will be rolling his own toward your gate. In between rolls, you can set up various defensive stations along the course, which is often windy and full of natural obstacles. I started out by playing the first tutorial, which explained these simple concepts to me. Before each level is a short cut scene that highlights the art style of that particular section, which adds even more charm to Rock of Ages. After quickly finishing off the tutorial and patting myself on the back for being so good, I jumped ahead to an early level in the main game. In this level, I found an actual challenge, and discovered that Rock of Ages wasn't as easy as I thought. Clumsily rolling boulders towards the gate and haphazardly placing towers in a hasty attempt at defense is not going to get you very far in this game. There is some strategy involved, but you also need to think on your toes, because your foe is always moving, always building, always ready to roll. While you're trying to decide how to spend your coins, there could be a giant, flaming boulder on its way to your gate. The rolling and building required in each level is balanced really well, and seems like it could add enough variety to keep Rock of Ages from getting stale. After playing only a couple of levels, I'm even more excited to play through the full version of this game, which will hopefully happen in the next few months. The strategy is addictive, the art direction is interesting, and it has the potential to be a standout downloadable title. 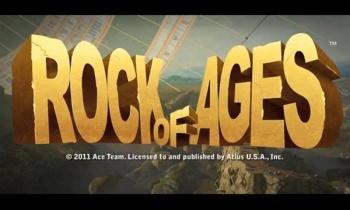 Rock of Ages will be available for the PC, Xbox Live Arcade, and PlayStation Network in 2011.